Today at lunch(6-20-2000), I read about GPS Stash Hunting on the sci.geo.satellite-nav USENET newsgroup and found Mike Teague's home page. Check it out and then click on Missouri listed under "Active Stashes". http://www.triax.com/yngwie/gps.html I could not find any Geocache sites to go hunt this evening so I went out in the rain and made my own. I expect it to be the first in Kansas City(turns out to be the first in Missouri). I found a nice location along side the Watts Mill walking/bicycle trail in South Kansas City. 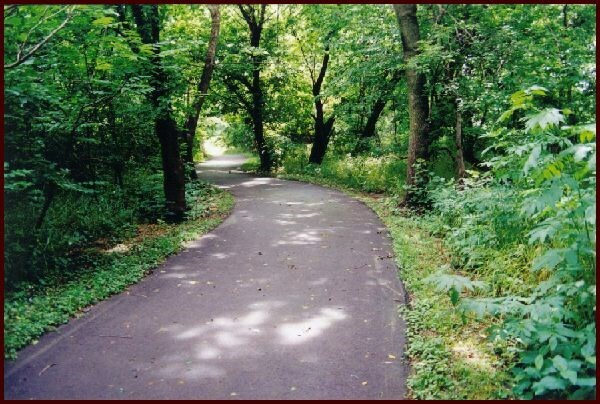 As of March 2002 the trail is now completed from a little east of here, to about 35 miles in the south end of Olathe, KS. I have walked the entire trail. It's paved all the way. It's great for walking, jogging, biking or roller blading. The shortest distance from the trail is not the best route. Please check for muggles along the creek before you go after the cache. The muggles have stolen the cache twice so far. Please rehide as well as you found it or better. A wheelchair can get fairly close. Haqre ebpx cvyr, cyrnfr pbire jryy jura svavfurq. Gurer ner n ybg bs zhttyr/jrngure vffhrf urer.